My breed was originally developed in Germany to work as a security dog. My coat is short and smooth and comes in various shades of brown to fawn with white markings. I was introduced into the United States at the end of World War I when returning servicemen brought me home with them. I became very popular and valued as a family pet and guard dog. I do need quite a bit of exercise to stay healthy, happy and fit. When fully grown, I am between 21 and 25 inches tall (53.3 to 63.5 centimeters) and I weigh between 53 and 71 pounds (23.9 to 32 kilograms). � 1996 - 2008 Dogs4Sale.com. All rights reserved. Photo � 1996 - 2008 Corel Corporation All rights reserved. Used under written license. 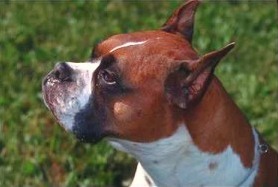 We have no Boxer Breeders listed at this time. Click here to place your Boxer Ad!